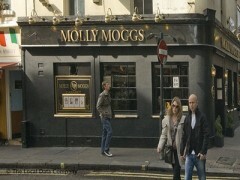 About: Molly Moggs is a traditional pub with a relaxed atmosphere situated in the heart of London. They serve real ales and also have a juke box and fruit machines. Ive been going to molly moggs since mamamia was originally on up the rd, years! this year we celebrated New Years eve in there. Bette and Jeff were fantastic,as were the staff and customers. fab atmosphere every 1 so friendly xxxxx c u all soon. the mad whitstable girls. This place is a pure gem, we visited on a Sunday afternoon and the drag queen Bette was fabulous and so friendky, this is a really warm and friendly place indeed and we stayed all day finally staggering out after the second drag queen show, Jeff Kristian, the staff were pleasant nd helpful and they mixed me a mean Bloody Mary. A liitle gem in the vustling streets of Soho, we will be returning to this place on our next visit to London. I went to Molly Moggs the first time i ever went to london which was October last year. It was mint. The stagg are welcoming, fit, and very good at what they do. The drag artists are great, and a big thank you to Bet Rinse for making my first time in Molly Moggs a positive and enjoyable atmosphere!! !